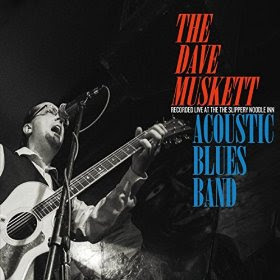 I just received the newest release, Recorded Live At The Slippery Noodle Inn, by The Dave Muskett Acoustic Blues Band and it's tight and clean. Opening with That Kind of Walk, an easy going blues based shuffle, Dave Muskett on vocal and guitar is joined by Mark Carnes on harp and backing vocal, Jay Arnold on bass and backing vocal and Charlie Bushor on drums. On Ain't My Good Girl Now, Muskett leads the way again on a nicely picked track with the tempo and general feel of Alice's Restaurant. Very cool. She Can't Give Me The Blues is a nice, easy shuffle with warm harp soloing. This is one of my favorite tracks on the release for just this reason. Handyman Blues has a deeper blues root but still retaining that easy flow. With a smooth guitar solo from Muskett and Carnes' harp work, this is a strong contender for the radio track on the release. Ain't Got It All has a Jimmy Reed touch and a more deliberate blues styling. I particularly like Muskett's vocals on this track, answered by Carnes on harp. Rain Song breaks the run with a really funky dobro rhythm. A cool sliding pattern, played against Carnes on harp and Bushor on drums makes this another of my release favorites. Sweet Mary Jane has a cool Robert Johnson feel with slide dobro and traditional blues style guitar riffs. With clever word smithing, this is bound to be a crowd favorite. Got A Need has a Jimmie Rodgers feel with a real swing, with some flashy acoustic guitar riffs and a bopping harp solo. Semi-Naked Shoe Shine has a nice polish to it and a warm feel. Arnold drives the train on this one with his bass lines and solo exchanges between Carnes and Muskett give this track real traction. Take A Look At This has a more raw, alive blues feel with the absolute best vocals on the release. The track doesn't stray far from the basic root line and I really like that. Very cool! Pet That Thing has a strong Piedmont style and overt lyrics that are curious and funny. With Carnes on harp and and a tight bottom, this is the absolute crowd favorite. Wrapping the release is You Gotta Know with it's Jimmy Reed feel. Muskett whips out some real nice acoustic guitar riffs and Carnes ices the cake as the band ties this one up neatly. Very nice!